Suboxone is an opiate narcotic pain reliever that is also used to help people detox from oxycontin, vicodin, percocet, lortab, methadone, codeine, fentanyl, morphine and heroin. Suboxone is similar to heroin, morphine and codeine, but does not provide the same euphoria that those drugs do. Suboxone can lessen the withdrawal symptoms from opiate overuse especially anxiety, cramps, insomnia, agitation, spasms and nightmares. However, if Suboxone is overused or misused, users report more severe withdrawal symptoms upon stopping use. Suboxone, taken with tranquilizers, antidepressants, sedatives and alcohol can be dangerous and coma or death can result. Side effects from using Suboxone may include trouble breathing, abdominal pain, dizziness and drowsiness, constipation, nausea, depression, headache and mood swings. Individuals using Suboxone to transition from another drug may still experience withdrawal symptoms as their system detoxes from the other drugs. When the individual stops taking Suboxone, they may experience withdrawal symptoms from the Suboxone if they have not followed a rigid step-down regimen. Withdrawal from Suboxone is similar to that of all other opiates and can be painful and uncomfortable. Depending on the length of use, withdrawal symptoms may last several days. Withdrawal symptoms may include anxiety, sweating, cramps, abdominal pain, watery eyes, runny nose, yawning, insomnia, agitation, seizures and suicidal thoughts. When you are ready to stop taking Suboxone, there are several different options available to you for Suboxone detox treatment, such as outpatient medical detox or inpatient traditional detox or inpatient IV therapy medical detox. Outpatient medical detox makes it possible for you to continue your daily routine of work, school and taking care of your family. You will self report to a clinic or a doctor's office to receive medication and detox at home. For an individual trying to detox from Suboxone, which is a medication used in detox, this method may not be the best one for you. It is important that you discuss this method with your doctor. Traditional hospital and IV therapy medical detox are both inpatient detoxes, but there are some vast differences. Many hospital detox facilities places patients in psychiatric units and use oral medication that patients report as ineffective at relieving their withdrawal symptoms. On the other hand, IV therapy that is offered at a few private detox centers uses intravenous therapy to deliver medication. This is an important method because it allows the medication to be adjusted as the withdrawal symptoms change which keeps the patient more safe and comfortable. 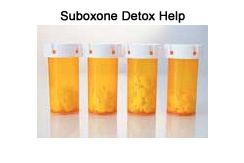 After detox, you may feel you need a program that to help you in rebuilding your life after Suboxone use. Freedom Model Retreats offers a cognitive behavior education program that will help you identify thought and behavior patterns that have contributed to your drug use. The Freedom Model Program will teach you how to develop new habits and behaviors that will help you achieve long term success without drugs.